I've only seen Brian DePalma's 1976 Carrie once before, last Halloween for that matter, and I had the same reaction to it I do to many "classics" that I've seen removed so far from when they were originally released that an honest reaction is hard to have and to speak negatively about a film deemed with that title, whether it has "horror" in front of it or not is typically taken as heresy. The film was fine enough for what it was and more than anything I enjoyed actually seeing those iconic moments put into context as well as featuring early performances from Sissy Spacek and John Travolta. Still, I wondered what we might get from an updated version of the story as the source material has always been an exaggerated twist on the effects of bullying and with that being a hot topic as of late not only would a re-telling of Stephen King's novel be timely and introduce the material to a new generation but it might be able to instill some faith in these younger audiences of today that grew up on countless Japanese horror remakes and found footage flicks that there is more to the genre than these kinds of films and that scary movies don't have to be about the gimmick, but can actually relate to the issues of the real world. That being said, since 2003's re-make of The Texas Chainsaw Massacre there have been a slew of re-makes giving fresh eyes to the horror classics of yesteryear (or more the studios trying to make money off familiar brand names) and though the majority of them have been plagued by generally bad reception this new incarnation of Carrie is playing in a different arena because it at least seemed to have a few things going for it the others didn't. To say this is to refer to director Kimberly Pierce (Boys Don't Cry) and her claim that her version of the film would be more of a strict adaptation of King's novel rather than pulling from the DePalma film. The added value of having such a prestigious cast that includes Chloë Grace Moretz and Julianne Moore didn't hurt much either. And with that all being said, this new imagining never comes off as bad or disrespectful, but in fact is fairly horrifying and effective if not for the fact it's overly familiar and ultimately a little pointless. 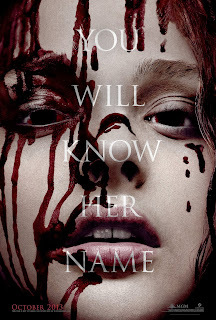 Chris Hargensen (Portia Doubleday) bullies Carrie White (Chloe Grace Moretz) without remorse. I have read a few things concerning the differences between Pierce's new film and the specifics of King's novel which seem minor, but more it was the differences between this new film and DePalma's as Lawrence D. Cohen, who penned the original screenplay, was also a contributor on this one. It was clear from the opening sequence here though that there would be a different tone to the going-ons of Carrie White (Moretz) and her ultra-religious mother, Margaret (Moore). Beginning with an intense intrusion on the birth of Carrie as Margaret sits alone in her upstairs bedroom rolling around in her sheets, covering them with blood and praying we catch a glimpse of the kind of tormented and truly terrifying performance Moore will deliver in the role that earned Piper Laurie and Academy Award nomination. It is the little touches such as these that strike a chord the original didn't care to mention and especially in the dialogue where Margaret refers to her daughter as a cancer that is lifted straight from the source material that we see the real extent of Margaret's delusions. This is only emphasized and pushed to its limits by the performance Moore gives and lends to a more than serviceable new take on the old material. The film then picks up on familiar ground as we meet Moretz's Carrie and her insecure, timid self as she is easily outcast in gym class and then patronized in the locker room when she receives her first period and doesn't know what is happening and is under the impression something is clearly wrong with her. Adding to the cruelty of Carrie's fellow high schoolers in this new version is the implementation of cyber bullying as now Chris (Portia Doubleday) not only torments Carrie consistently but she films the crowd of "mean girls" tossing tampons at her and eventually posts it on YouTube. We meet Sue Snell (Gabriella Wilde) and her all-American boyfriend Tommy Ross (Ansel Elgort) who develop a sense of sympathy for the sheltered Carrie as does Miss. Desjardin (the always pleasant Judy Greer) and surprisingly these pretty faces do more than simply fade into the background, but instead bring legitimate personality to what are archetypes we've seen countless times before. The film hits the familiar beats we expect it to, but more than anything I was surprised by the care that was taken with the pacing and delivering the true arc of the characters that is meant to justify the large, more grandiose climactic scenes as compared to the rest of the movie. There is a certain attractive quality to the darkness with which Pierce approaches the material and how she allows it to simmer rather than throwing it all at the audience with constant hopes of getting us to jump as often as possible. This isn't the type of scary movie where the audience is meant to go along on a ride with the core group of characters as we watch them endure scary situations that give us the chills, but more a cautionary tale of things many of us have probably done or been the subject of in our lives and are made to feel bad about them or in some cases, vindicated. After all, that seemed King's original intent, to give the underdog a fighting chance but show that we can all be corrupted with the gaining of some kind of power. In Carrie's case she is bulled over by the kids with the most popularity in school while the development of her telekinetic powers shows her not only using them to exact revenge on those that have made her life a living hell, but to kill anyone in her sites. There is no sense of leverage or entitlement for the underdog here and that separates the story from being one of the dark horse rising up and coming out on top, but instead a young, naive teen who was sheltered her entire life and longed to be like everyone else becoming exactly that. We have a glimmer of hope in Sue and Tommy, but the severity of the final act of the film displays an even further misunderstanding of our title character and Pierce intelligently doesn't attempt to humanize Carrie, but instead understands she will never be like the rest and continues to alienate her so that her actions feel appropriate if not justified. This brings us to the issue of what exactly is wrong with the film then? Honestly, not much. It is a competent piece of filmmaking from a director who knows a thing or two about tortured adolescents but there is neither nothing striking about this new imagining nor does it break any barriers or offer a drastically different take on what we've seen before; the changes being more minor than actually giving a different approach to the material which again renders this competent, but not exceptional or necessary. Carrie finds her justice after being humiliated in front of the entire student body at prom. That being said, I wouldn't mind re-watching this film again annually around this time of year given it is more applicable to the times in which I grew up and exist in than the previous incarnations, but it doesn't possess that watchability factor to be seen outside of the season it so nicely goes hand in hand with. What allows this ultimately unnecessary re-make worth a look though are the performances from the two most notable names in the cast. Moretz offers a more confident, more aware Carrie than Spacek's frightfully timid take where she was almost afraid of herself and what she learned she was able to do. Moretz still gets the fragile persona down in the opening scenes and the innocence she conveys in the moments of her limited happiness as she attends prom and dances with Tommy is spot-on allowing the audience that sense of feeling happy for her as much as we can, but as she begins to realize she has something unique to her she comes to command those powers rather than fear them just as she does almost everything else. Spacek's Carrie, despite having the same abilities, never seemed to intentionally do the damage she brings down upon the prom, but Moretz's version is clearly intent upon destroying everyone in her path as she goes after the source of her misery in Doubleday's truly nasty Chris Hargensen and her equally troubled boyfriend Billy Nolan (Alex Russell). At times it is both alarming and absolving to see Carrie finally gain some control over her life, but at the same time it is equally depressing to know she couldn't amount to more and instead resorts to the exact kind of hate that made her who she was in the first place. That ignorance and hatred that fueled her troubled life is made incarnate by Moore's Margaret and the veteran actress who literally can do no wrong and elevate any project she chooses to be a part of doesn't disappoint here, but is able to add more and more layers to the creepily self-defecating mother figure Carrie has had to learn from and gauge her actions from her entire life. These performances offer reason to see the film, but are not enough to win over the idea we needed this update to better understand the lessons of King's story. DePalma's has aged well and would have continued to serve it's annual purpose, but the studio system cries foul and deems it necessary we get a new take on the same old things year after year whether innovation is present or not.